The backstory of 'Dark Knight Rises' villain Bane was explained more in scenes that were eventually cut from the film, according to one of the designers. Lindy Hemming, who designed costumes for the film, let slip details that were left on the cutting room floor by director Christopher Nolan, and also how he came to wear his mask. “He was injured early in his story. He's suffering from pain and he needs gas to survive. 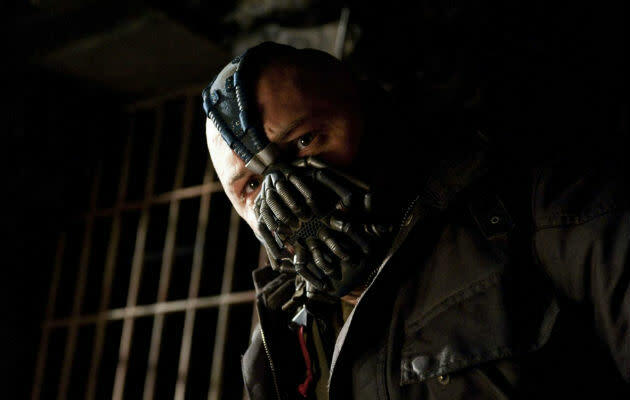 He can't survive the pain without the mask, which is exactly the same as the comic-book Bane,” she told GQ. Hemming also reveals cut scenes which revealed more about Tom Hardy's hulking villain. “The other thing that you should have seen during that sequence is him being injured in his youth. So one of the fundamental things about his costume is that he has this scar from the back injury. Even if he hasn't got the bulletproof vest on, he still has to wear the waist belt and the braces,” she added.